Virtual reality (VR) is valuable for motor skill and soft skill training. That said, computer-based training (CBT) approaches dominate the training sector and offer a level of convenience unavailable in other training platform. When done right, CBT can be highly effective. However, a major shortcoming of nearly all commercial VR or CBT training platforms is that all too often, the focus is on one-off training and not on training for retention. The goal of training is to convey information that will be stored in long-term memory and maximally insulated from forgetting. It does no good to train an individual to perfection today, only to have that information forgotten tomorrow or next week. The brain is hardwired to forget. This construction is adaptive, because human memory has limited storage capacity. Retention is the true goal of training. For training content to be retained and guide long-term behavior, it must be stored and represented in long-term memory. We must train for retention. The brain is hardwired to forget. Retention is the true goal of training. The forgetting curve, discovered by Hermann Ebbinghaus, plots retention as a function of time. Initial retention (denoted by the blue dot) is 100 percent. The red curve is the forgetting curve. Forgetting is rapid, with only 40 percent of the information retained one day after training, and only 15 percent retained one week after training. The specific numbers differ across individuals and content, but the trajectory is always the same: We forget over time. Training for retention focuses on reducing forgetting. Three critical elements are required: high-quality, engaging content; optimized training procedures; and spaced testing and targeted retraining. Step 1 in training for retention is to construct high-quality, engaging content that accurately conveys the goals and objectives of the task in a compelling and engaging manner. Content should be created by experts in the field who know the job and can accurately convey the information. In general, VR content is highly engaging. The immersive properties and rich, consistent contextual cues associated with VR improve the quality and speed of initial learning. In general, VR content is highly engaging. Generating high-quality, engaging content in CBT can be more challenging but is far from impossible. Two of the most effective ways to increase engagement in CBT are to inject humor into the content and to use multiple content media. A dynamic emoji or a cartoon figure can be very effective when teaching someone a new software package. Humor induces mild positive affect that is known to enhance learning, according to research from the University of California, Santa Barbara; the University of Texas, Austin; and the University of Maryland Baltimore County. Incorporating multiple forms of media, such as text, figures, audio and video, within the training content increases engagement and allows individuals to focus on the content that is most effective for them. Step 2 in training for retention is to use optimized training procedures. These procedures differ as a function of the content and the learning system optimized for that content. For example, if the training is on motor skills in medicine or HR, then you should use training procedures optimized for the behavioral skills learning system. Learning in this system is mediated by the basal ganglia and is critically dependent on the neurotransmitter dopamine. On the other hand, if the training is on cognitive skills, such as data analysis or how to use a CRM, then you should use training procedures optimized for the cognitive skills learning system. Learning in this system is mediated by the prefrontal cortex and medial temporal lobes. One strength of VR is that it can be implemented in such a way as to target the behavioral skills system or the cognitive skills system. CBT is generally biased toward training the cognitive skills system on skills such as computer programming, software (e.g., a CRM, Word, Excel) or licensing. Even so, you can modify CBT training procedures for the behavioral skills system. Step 3 in training for retention is to incorporate periodic testing and targeted retention training. Periodic testing identifies poorly retained information that can be retrained. Consider the figure below. 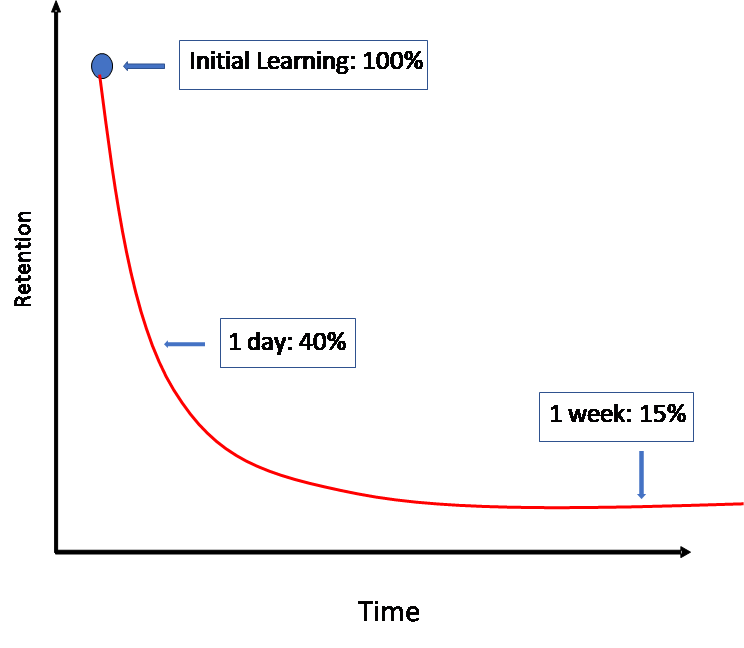 The blue dot again denotes 100-percent initial learning, and the red curve the forgetting curve (assuming no testing and targeted retention training). However, if the learners are tested a few days following training and is retrained on the information that they forgot, then they are back at 100% retention. Notice also that forgetting is reduced following this first test and targeted retraining session. That is because testing and targeted retraining stimulates long-term memory storage. Repeating this process a second, third and fourth time reduces forgetting. Testing and targeted retraining is at the heart of training for retention. Testing and targeted retraining stimulates long-term memory storage. VR and CBT platforms are ideal for incorporating periodic testing and targeted retention training. This step is also a perfect place to incorporate artificial intelligence and machine learning (AI/ML) algorithms to enhance personalization. For example, you could track overall performance as a function of training medium and focus at an individual level on the medium that works the best. The sky is the limit. VR and CBT platforms are ideal for incorporating periodic testing and targeted retention training. It is important to be clear that the science of optimized training is a robust and growing research area. This article glosses over many of the details and instead highlights the important factors that can be easily addressed. Training for retention strengthens long-term memory representations and insulates that memory from forgetting. The trained skill will become ingrained and will be elicited faster, and with less effort, thereby improving performance. W. Todd Maddox, Ph.D., is the CEO and founder of Cognitive Design and Statistical Consulting, LLC. He is currently writing a book focused on bringing the science of optimized training into the commercial sector.